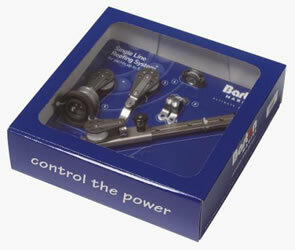 This single line reefing kit allows reefing control lines to be led aft to the safety of the cockpit. 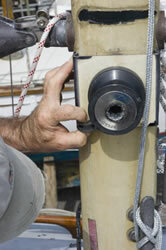 The system makes reefing your mainsail a quick and easy operation. Just lower the sail to a pre-determined mark on the halyard, tension the reefing line and trim the sail – all from the cockpit. If you are fitting 2 single line reefing systems for reefing of 2 points of the sail , the position and angle of the sail on the tang block No3 and the bullseye No4 may vary. We recommend taping all items in place first before drilling any holes and reeving the line to ensure friction is kept to a minimum. 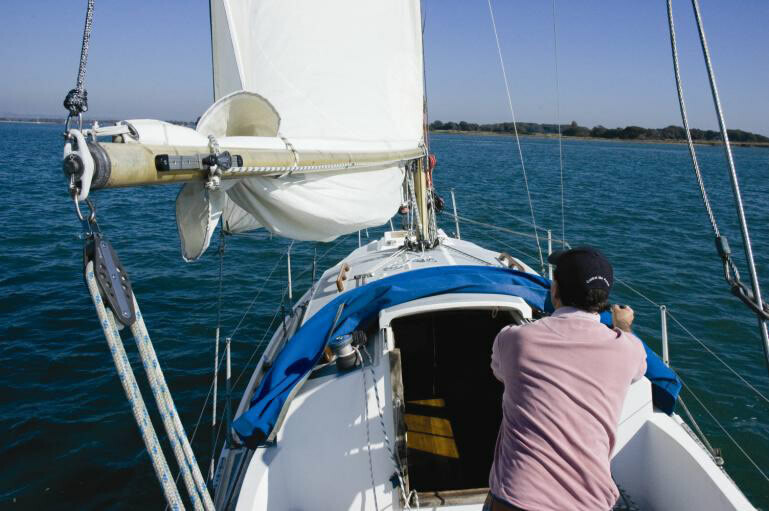 Decide whether to place the track on the port or starboard side of the boom. The line running back into the cockpit will be on the opposite side to the position of the track. The forward end of the track should line up with the position of the reefing eye on the sail. Ensure the track is at 90º (Y) to the centre line of the boom (X). Position the track and mark first fixing location. Centre punch second fixing hole, loosen screw of first fixing, allow track to pivot away then drill and tap for second fixing. Repeat this procedure until all fixings are installed. After securing, the screws can be removed and the surplus length inside the boom cut off, to prevent possible snagging of internal control lines on the sharp ends of the screws. Position the slide on the track ensuring the plunger end of the slide is aft and the becket on the slide is facing down. 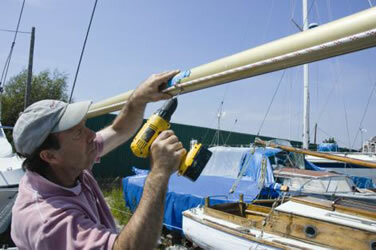 (This may need to be adjusted depending on whether it is fitted on port or starboard side of the boom. The eye will rotate but may require the use of pliers to carry out this operation). The position of the slide on the track can be adjusted during a sail trial. The two plastic end caps can now be fitted ensuring they locate over the end of the track. (This is a push fit) Use the centre punch to mark position then remove before drilling and tapping as previously stated. This should be installed on the same side of the boom as the track positioned on the mast so that the line pulls down and forward at 45º when reefed. If fitting two systems this position may vary Using the tang as a template, drill and tap as previously stated then secure using the 5mm pan head machine screws and washers provided. After securing, the screws can be removed and the surplus length inside the boom cut off, to prevent possible snagging of internal control lines on the sharp ends of the screws. The bullseye should be positioned on the opposite side of the mast to the tang block so the line pulls down and forward at 45º when reefed. If fitting two systems this position may vary. Use the bullseye as a template to mark the position of the two fixings with centre punch then, remove bullseye and drill using a 3.3mm drill before tapping using the 4mm tap. . After securing, the screws can be removed and the surplus length inside the boom cut off, to prevent possible snagging of internal control lines on the sharp ends of the screws. 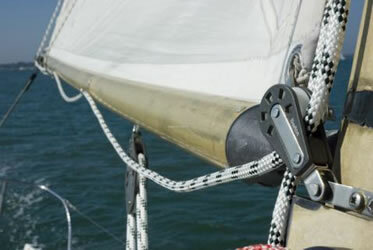 The two eye straps, which are positioned at 1/3 intervals between the slide and the tang block, are designed to stop the line from sagging, restricting headroom etc., when the Single Line Reefing system is not in use and under load. Attach a line around the sheave on the Slide and the Tang Block, measure 1/3 of the length between the slider and the Tang Block. This determines the position of the first Eye Strap. 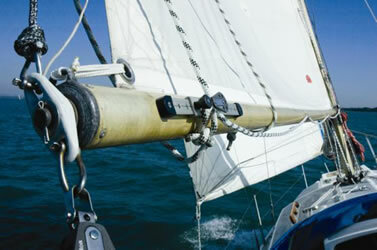 Ensure the Eye Strap is positioned so the reefing line runs directly through it to minimise friction. Use the Eye Strap as a template for drilling both 5mm holes then rivet using pop rivets provided. Repeat the process for the other eye strap at the next 1/3 intereval. The Stand Up Block should be mounted directly below the bullseye fixing and positioned so the block is angled toward the deck organiser. Take time to obtain correct position to minimise friction. Use the Stand Up Block as a template and mark the four fixing holes. Remove block prior to drilling 4 x 5mm holes. 5mm counter sink stainless bolts are required for fixing down the Stand Up Block. 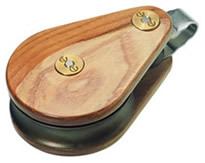 These are not provided as deck thickness etc. may vary. To attain spread of the load, use a pad or penny washers on the underside. When fitting the Stand Up Block, use a high quality marine sealant to provide a durable water seal. 8 mm line required (Not supplied). The line starts by being tied or spliced to the becket on the bottom of the slide (1) under the boom, up through the eye, down through the sheave on the slide, then through the two Eye Straps (2) on the boom, around the sheave of the Tang Block (3), up through the eye on the sail, down the other side through the Bullseyes, to the Stand Up Block, then off to the Deck Organiser. Safety: Never set a sail whilst the craft is out of the water. When at dockside only raise the mainsail when the conditions allow, ensuring that the craft is securely tied and there is no possibility of a gybe. The position of the slide can be altered, by lifting the plunger and re-locating the slide. 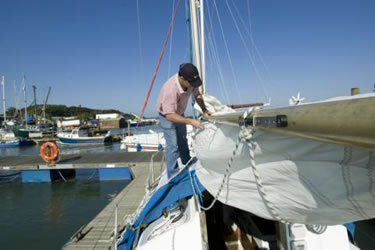 It should be positioned so the line leaving the Eye in the sail pulls down and aft between 30º and 45º. 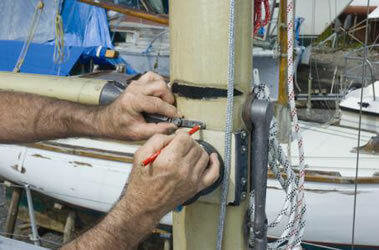 Lower the main halyard to the correct position for reefing and reef mainsail. 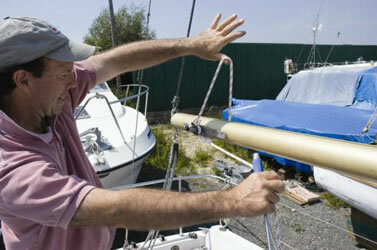 If correct, mark the halyard at the position of the cleat with permanent marker. 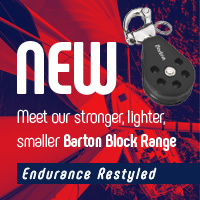 Set the Topping Lift which ensures the boom does not fall accidentally (By using the Barton Boomstrut together with the single line reefing system this would eliminate the need for a topping lift). 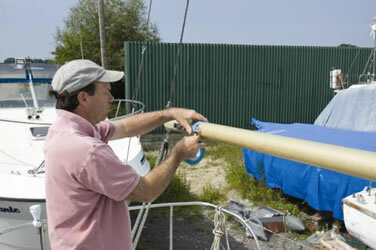 Ease the halyard to the marked 'Reef' position, pull in the reef line then tension the halyard. The sail is then reefed. 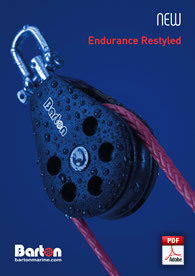 The Barton single Line Reefing system is yet another great product from Barton. 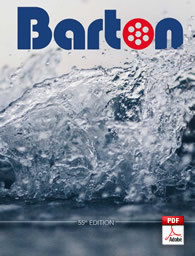 A large range of marine hardware for yachts up to 50 foot is detailed in our catalogue, available on request.